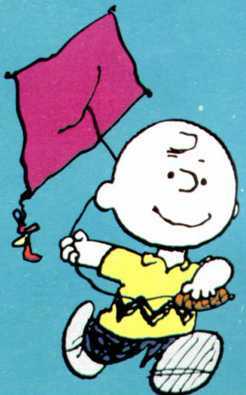 Exercise #27: "Flying a Kite"
Describe a person flying a kite. Jeanette pedaled her legs as fast as she could through the grassy field, her breathing heavy. Her heart raced as her blond curls whipped in the wind, her mouth wide open in a subconscious attempt to get more oxygen into her system. Cheering erupted from behind her, and she stopped running and looked up. Where was it? The sun was in her eyes, making the sky appear blanched and empty. Shielding her eyes with her left hand, she peered further into the expanse of sky. A red diamond was bobbing and weaving several feet above her, and soon she could see the string leading down to the plastic handle in her right hand. "Jeanette," her mother said as she was running up to her. "Why don't you try steering it?" For a moment, Jeanette was entranced. The kite was dancing wildly in the air's current, and she stared at it blissfully as she held the handle tightly. "Steering it. Why don't you try?" her mother said, imitating the pull and turning of kite guidance with her hands. She looked at the handle. Steer it? "But I don't know how." "It's easy!" Her mother knelt behind her and wrapped her arms around her body, placing her hands on either side of her own. I was never really a kite flyer as a kid. My sister and I had a couple of kites, but I think we flew them... a few times? Not really worth the purchase. I do vaguely remember one of them breaking, though, but it was not because of severe kite usage. I believe it was just a poorly constructed P.O.S. Like I said, it's my favorite season. Gorgeous on oh-so-many levels. That's all for this post, but before I leave, I've added this for your viewing (and possibly singing) pleasure. I enjoyed this post. Love the writing exercise approach. The topic reminded me of the book The Kite Runner by Khaled Hosseini. I don't remember flying a kite as a child. Who could not relate this to Charlie Brown, right?